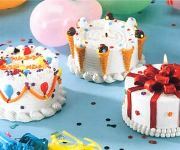 Fun Birthday Cake Candles will make your birthday party or any occassion special. This fun themed Birthday Cake Candles looks so real you'll want to eat it. Available in three styles happy birthday cake (has the writing on happy birthday on the top) ice cream cone cake (is adorned with ice cream cones around the cake) and gift wrapped cake (has the red gift wrapping on it). Sold individually and unscented.